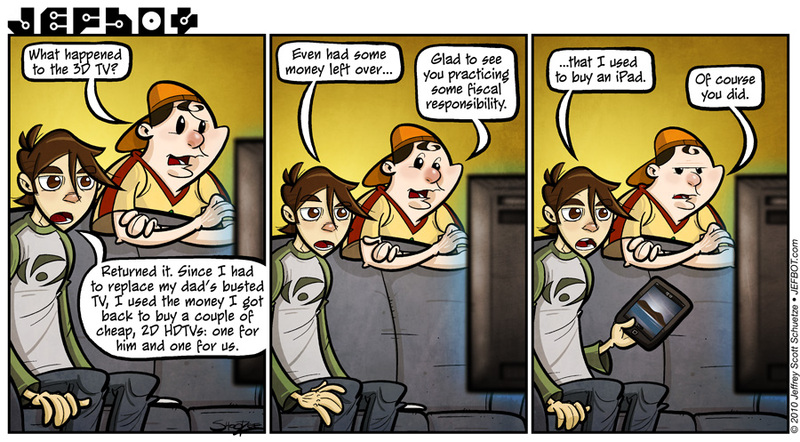 Today’s strip was totally me 5-10 years ago. When some new gadget or console would come out, I’d have to buy it, even if I couldn’t exactly afford it at the time. The original XBOX, Gamecube, PS2 and Gameboy Advance all went on my credit cards upon their release, along with a few games for each – and it wasn’t until several years later that I would pay those cards off, not to mention the interest they accrued. I’m much better about spending money (or credit) these days and am debt free now, I’m happy to say. That said, I did buy an iPad recently, but it was after much consideration, saving of money and the pending expiration of a gift certificate I had. I’m loving the device, but I’m sure you’ll hear all about it in future strips. Could it be that I am first? Anyway, I totally understand where you’re coming from, having been a Nintendo Fanboy for some time (until the Wii, tbh). and i’m with ya on all your faves: Blizzard, Nintendo and the Monkey Island games are all awesome. unfortunately, although there are some exceptions, i’ll still buy Nintendo’s flagship products sight unseen. i have Mario Galaxy 2 and Zelda: Spirit Tracks (though i haven’t had time to open them, yet) and will definitely be getting the 3DS upon release. I’m thinking Starcraft II and Diablo III will have to be bought, too. looks like it’ll take a few more years for my priorities to shift. lolzzzz. thats the way JB hahahaha. BTW. if u are thinking of getting rid of your ipad in the near future please inform me. ur situation happened to me too. i bought the first iphone. was disappointed and returned it for a nokia n97. lolz. Ya know, I think I want an IPad but I’m still not sure. I will certainly wait til they come down in price and I want to be able to pay cash for it. When that happens I will then consider it. First I think I will get a netbook and a portable hard drive. Home computer is the sucketh at the moment. I will be trying to find a new place to live and packing next week. JOY!! *searches for the sarcasm font* So I most likely will miss next weeks comics. Can’t wait to come back the week after next and see whatcha got for me! yes, it’s the curse of the beautiful, Pixie. you’ll just have to learn to live with it! i’m sure when the new iPads come out next year the prices will come down. and although, in the past, i would’ve just put one on my credit card the day they came out, i paid for mine out of my checking account. i guess my priorities have shifted a bit! I was the same way and it took a lot of realization to come to grasps that buying something the day it comes out is as smart as buying a new car. 6 months down the road the same thing is cheaper and comes with more stuff. I have uncanny patience with this. most of the time. I can wait 6+ months to buy a “new” model after it came out so it’ll be cheaper. Am even willing to wait a whole year or more, lol. Gawd I hate the Ipad it has less features then an netbook and cost far more just cause it has the streamline design apple is famous for. I will give apple props for the app store, but I refuse to justify its need to create the Ipad. Good comic as usual I did get a chuckle out of it. i had the same thinking as you, Prophet (as you’ll see in the next strip), but after a guy i respect told me i should give the iPad a try, i did, and i absolutely love it. it’s a completely different device than a laptop or netbook, and fills a completely different need. i really didn’t think i was going to dig it as much as i have. If I knew anything about fiscal responsi..uh..responsa…. Fiscal responsibility is something everyone needs to learn on their own on their own pace. Still seeing as Im waiting for Starcraft 2 to come out to order it and all Starcraft books I should probably just shut up. where do you store your stash, Shanna? definitely sounds like you can relate to my hoarding tendencies. and while i don’t really have my buying sprees “under control,” i do spend way less than i used to! which is progress, right? CFs’ expression in the last one is priceless. thanks, Animie fan! glad you liked it! Good news! I have an audition for the newest Drew Barrymore movie tomorrow! A single line extra…I’m hopeful! Hahaha! That third panel is priceless! Awesome comic, dude! Hey, the iPad is an investment! Great job Jefbot! Love the last frame, The Cornfathers eyes are perfection! it’s true, Funnyshaffer! though at the moment, i wouldn’t wanna sell it. well, until iPad 2.0 comes out. Semi-Autobiographocal….ha! More like FULLY-Autobiographical. This strip sums you up to a “T”, bot. You’re such a good son and an even better consumer. I love the dialogue and how you always include the latest gizmos and gadgets. And you always find the funny! Way to go, bot! Well played, Bot. Well played. Which version of the iPod Touch XL did you get? it really is an iPod Touch XL (although apple freaks always hate this designation) – but the extra size (and the better processor) give it functionality beyond its roots as an iPod/iPhone. so awesome. Of course you did…. WHY!?! the money used to buy an iPad coulda bought you 500 beers!! BEERS!! PLURAL!!! WHYYYYYY!!!! I made the same face that Cornfather did when I found out you actually bought one. I am still disappointed in you for that. My boyfriend has the iTouch, if I got a touch screen wifi defice, I’d get that one. I don’t like the fact that I can’t fit an iPad into my pocket like an iTouch. I just hate how expensive they are. I almost got one when I upgraded my iPod but I went for the 160gb classic for a lower price and a giant harddrive. glad you like the Cornfather’s expression, even if you’ve seen it from jefbot’s POV before. heheh. So which version did you get? Mine is the 64G/Wi-Fi only. So, this happens to be relevant not to this but to a previous strip, about lucid dreams. We were discussing how I keep nearly having them. Well, I nearly had one again, where I realised I was dreaming but somehow failed to control it, and then I was woken up. On the topic of THIS strip: I don’t really get the point of an iPad. Isn’t it just like a giant iPhone, or something? Then again, I’m not a huge fan of anything Apple. keep on trying, Spaarfor – the more you practice, the more control you’ll have. realizing i was dreaming/losing control/waking up was exactly what i went through when i first started practicing. you’ll get the hang of it eventually. the iPad controls exactly like a giant iPhone, yes, but being able to *really* surf the web, type, play games, watch netflix and ripped movies, and more, all on a compact device i don’t need to power up like my laptop – is AWESOME. i use it every day, which is way more than i thought i would. Ewww… iPad. I really have NO love for Apple products. Over priced, over hyped, and easy to break. Ok, granted, the IDEAS behind some of their products are kinda cool, but they way they’re marketed and produced is what makes them fail. But, if you make it shiny and tell people its the coolest thing in the world, then the iSheep will inevitably flock to it. and of course as soon as you bought it…it was out-dated. ahhh. so true. after many, many years, i’ve come to accept that as a reality of the gadget/gizmo/tech world, t_d. otherwise, i’d never buy anything. “bad money sense” is so hard to fight, Rinthia! iPad, eh? Too bad it’s not a portable tablet personal computer from apple. Then you’d REALLY have fun with it! And no, that was not a crack at something. Anyways, have you tried my experiment yet? I’m dying to taste the results vicariously. Oh yeah, and obligatory link to a truly awesome something that can barely be called a webcomic. If I know anyone in the right age range, you’ll find some parts absolutely hilarious. haven’t tried the experiment yet – my local grocery store doesn’t carry strawberry quik! but when i find it, i’ll give the experiment a try. looked at that webcomic, Neo, and it’s pretty funny! i love seeing different takes on the webcomics genre. HAHA this is just like how I am with my … how did you say … fiscal responsibility. This is why I, too, bought an iPad. And again with the gratuitous Mac garbage. -.- I seriously hope that tablet fad dies quickly. They are just so thrice blasted annoying!